Region: This caterpillar is found in eastern and central North America, and is also located in California. Life cycle: This insect produces one generation each year and overwinters as a larvae inside of fruit and nuts that have dropped to the ground. Physical Description: This 3/4 inch long caterpillar reddish orange to yellow with a brown head and two curved marks behind the head. 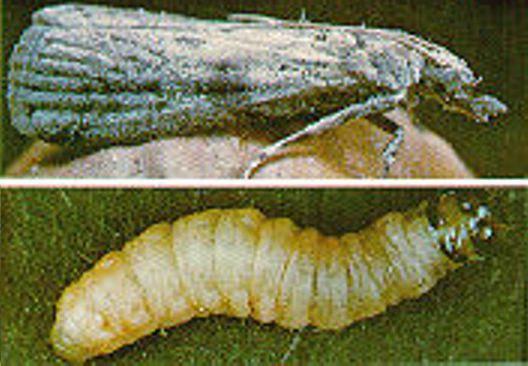 The adult moth is gray with dark diagonal lines and mottling, and has a wingspan of 3/4 of an inch. The eggs are laid in the ends of fruit and nut blossoms. Feeding characteristics: This pest attacks almonds, citrus, fig and walnut plants by drilling holes in diseased or damaged fruits and nuts. They feed inside a web until they pupate, and then exit as fully grown moths. Goniozus legneri and Pentalitomastix plethoricus. They affect the pupae and should be released all at once in early spring or after the harvest.